* Minister for Electric Power No.1 U Zaw Min received Mr. Gao Song, Vice President of China Guodian Corporation of the People’s Republic of China, and party at the ministry here yesterday. * The meeting focused on cooperation. 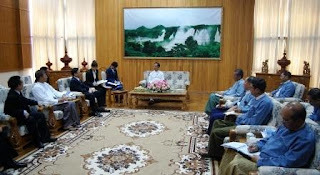 * Also present at the call were departmental heads of the departments and enterprises under the Ministry, General Manager Mr Li Hongyuan of Guodian Yunnan Power Co., Ltd from China, Chairman U Thein Tun of Tun Thwin Mining Co., Ltd and officials.